Scores of Palestinians, accompanied by Israeli international peace activists, held on Friday the weekly nonviolent procession against the Annexation Wall and Colonies in Bil’in village, west of the central West Bank city of Ramallah. 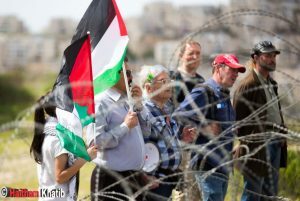 The protesters marched from the center of the village and heading towards the Annexation Wall near Abu Lemon area and were also accompanied by Vietnamese journalists. They carried Palestinian flags, and chanted for liberation and independence, and the release of all political prisoners. 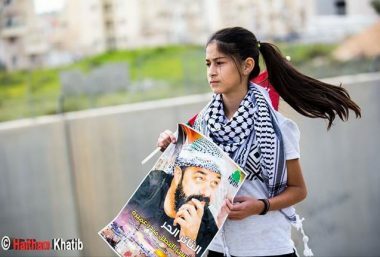 They also carried posters of political prisoners and imprisoned nonviolent activists, especially the world-renowned teen journalist ‘Ahed Tamimi, in addition to Israa’ Ja’abis and Monther Amira. 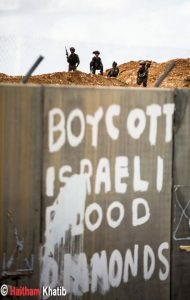 Upon reaching the gate of the Annexation Wall, some protesters started banging on it, and wrote graffito denouncing the ongoing illegal Israeli occupation, oppression and colonialist activities. They also chanted against the illegal U.S. recognition of occupied Jerusalem as the unified capital of Israel, in direct violation of International Law and various United Nations and Security Council resolutions. Furthermore, the soldiers attacked dozens of Palestinian and international peace activists, holding the weekly nonviolent procession against the Annexation Wall and Colonies in Ni’lin village, west of Ramallah, causing many to suffer the effects of teargas inhalation.